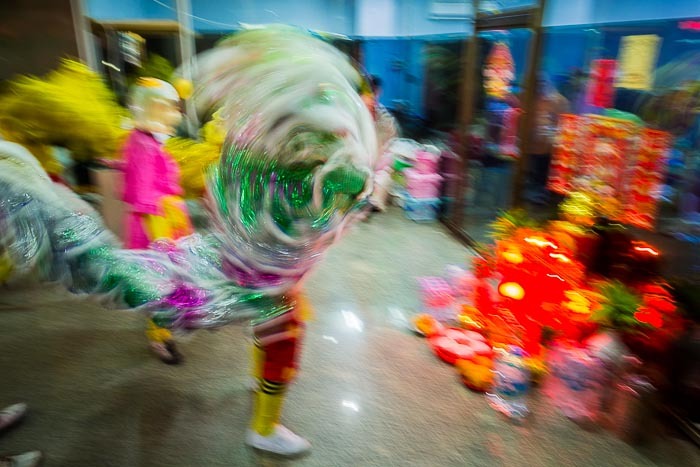 Lion Dancers perform in a jewelry store in Bangkok's Chinatown district. Two down one to go. Thailand celebrates three New Years holidays. January 1 is the official New Years day. 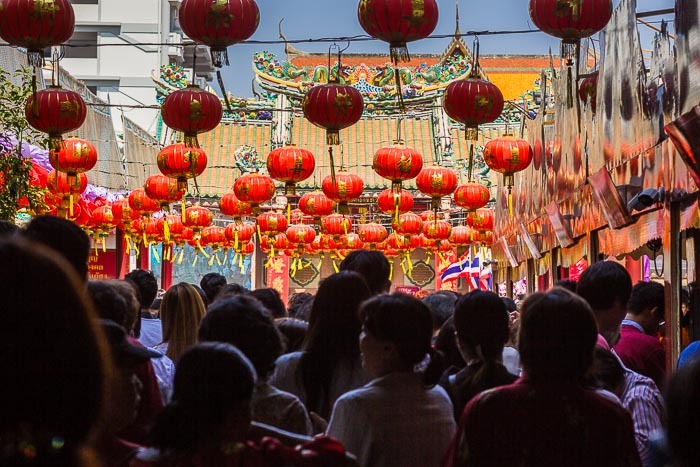 Then there's Lunar New Year, also called Tet or Chinese New Year, celebrated by the Chinese Thai community and in communities with large Chinese communities (like Hat Yai in the south) and finally Songkran, Thailand's traditional New Year, celebrated in April. 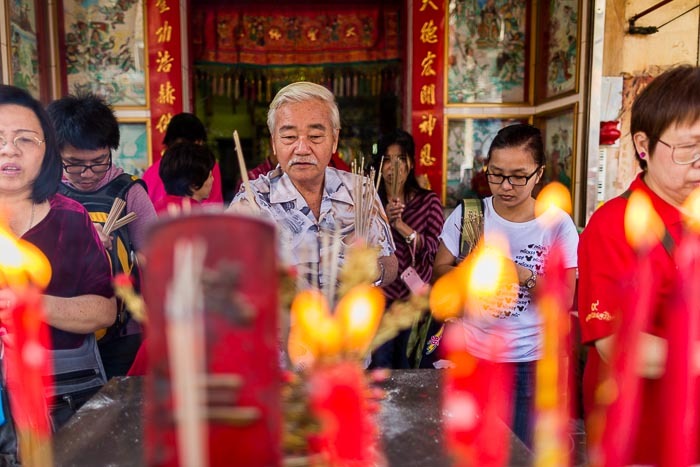 Chinese Thais gather at local temples and shrines to pay for a prosperous New Year. Most tourists think of Lunar New Year as a huge street party with Lion and Dragon dances and lots of food. That is a huge part of the holiday but it's also a deeply religious day. Many people go to temples and shrines to make merit and pay for a happy, healthy and prosperous new year. The colorful Lion and Dragon dances, which entertain visitors, also religious in origin. They chase away evil spirits and bring good luck to the patrons who pay the dance troupes to perform in their businesses. People crowd into a temple in Chinatown. I went to Chinatown early - about noon. I spent the first couple of hours walking from temple to temple photographing the spiritual side of New Year. The temples were packed. So crowded, even early in the day, that it was hard to move through the crowd. Later in the afternoon, when the light got a little better, I went out to the streets to photograph the dances and street party. 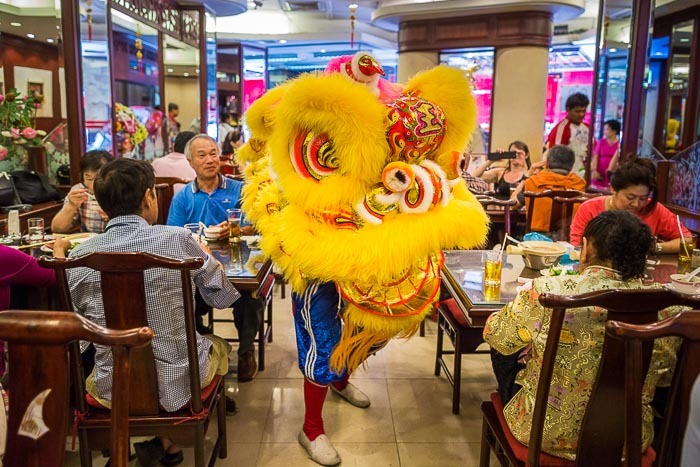 A Lion dancer goes through a restaurant on Yaowarat Road, the heart of Bangkok's Chinatown. I finished up early and headed home to edit because Chinatown in Bangkok becomes so crowded that it's essentially impossible to push through the crowd. There are more photos of Lunar New Year festivities in Bangkok in my archive or available from ZUMA Press.